The Z1 was a mechanical computer designed by Konrad Zuse from 1935 to 1936 and built by him from 1936 to 1938. It was a binary electrically driven mechanical calculator with limited programmability, reading instructions from punched tape. It was one of the first freely programmable computers in the world which used Boolean logic and binary floating point numbers. This computer was destroyed in the bombardment of Berlin in December 1943, during World War II, together with all construction plans. In the series of computers that Zuse designed the Z1 was the first. It's original name was "V1" for VersuchsModell 1 (meaning Experimental Model 1). It was renamed "Z1" to differentiate it from Wernher von Braun's Bombs, after WWII. The Z1 contained almost all parts of a modern computer, i.e. control unit, memory, micro sequences, floating point arithmetic and input-output devices. The Z1 was freely programmable via punched tape and a punched tape reader. The program tape was 35 mm film with the instructions encoded in punched holes. There was a clear separation between the punched tape reader, the control unit for supervising the whole machine and the execution of the instructions, the arithmetic unit, and the input and output devices. It was completed in 1938 and financed completely from private funds. Zuse received money from his parents, his sister Lieselotte, some students of the fraternity AV Motiv and Kurt Pannke, a calculating machines manufacturer in Berlin to do so. Zuse constructed the Z1 in his parents' apartment; in fact, he was allowed to use the living room for his construction. In 1936, Zuse quit his job in airplane construction in order to build the Z1. His parents were not enthusiastic, but they did support him any way they could. 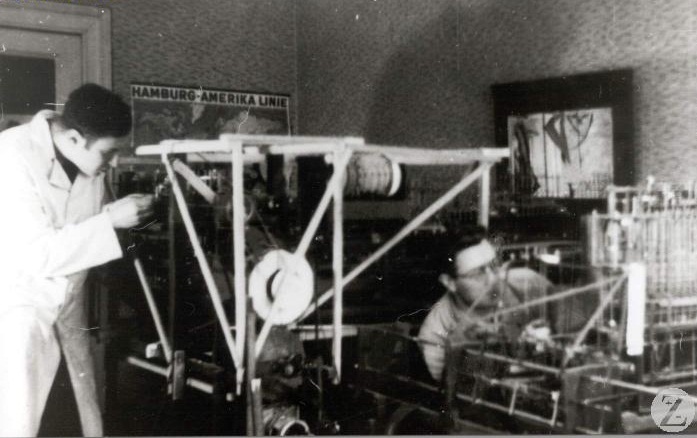 Zuse used thin metal sheets and rods to construct his machine. There were no relays in it. The only electrical unit was an electric motor (a vacuum cleaner engine) to give the clock frequency of 1 Hz (cycle per second) to the machine. The machine was never very reliable in operation due to the precise synchronization required to avoid undue stresses on the mechanical parts. The Z2 and Z3 were follow-ups based on many of the same ideas as the Z1. The original Z1 was destroyed by the Allied air raids in 1943, but in 1986 Zuse decided to rebuild the machine. He constructed thousands of elements of the Z1 again, and finished rebuilding the device in 1989. The rebuilt Z1 is displayed at the German Museum of Technology (Berlin). The Z1 was a 22-bit floating point value adder and subtracter, with some control logic to make it capable of more complex operations such as multiplication (by repeated additions) and division (by repeated subtractions). The Z1's instruction set had nine instructions and it took between one and twenty cycles per instruction. The machine had a 64-word floating point memory, where each word of memory could be read from - and written to - by the control unit. The mechanical memory units were unique in their design and were patented by Konrad Zuse in 1936. The machine was only capable of executing instructions while reading from the punched tape reader, so the program itself was not loaded in its entirety into internal memory in advance. The input and output were in decimal numbers, with a decimal exponent and the units had special machinery for converting these to and from binary numbers. The input and output instructions would be read or written as floating point numbers. Find out more about the architecture and simulation of the Z1 computer. View the technical drawings of the Z1 reconstruction. View the interactive 360° panorama of the Z1 reconstruction. View a simulation of the Z1 adder (LWJGL). View a simulation of the Z1 adder (WebGL). View a simulation of the Z1 adder (Java applet). View a simulation of a simple mechanical switch. View a simulation of a more complex mechanical switch . View a simulation of a mechanical switch to calculate the equivalence.